Pioneers in the industry, we offer truck weigh in motion, in motion truck weigh, truck weighbridge, truck weighing system, truck in motion scale and weigh in motion system from India. Sold More than 500 Machines . Trucks with axle load higher than legal limits cause a disproportionately higher percentage of damage to the infrastructure and adverse impact on traffic safety. Essae Truck Weigh in motion System (TWIM) is a robust, reliable, maintenance-free weighing mechanism designed for use on highway entries with non-stop heavy traffic. Weighing accuracy and performance are approved for trade use and for law enforcement purposes. When speed is critical and vehicle weighing is an integral part of the operation, Essae TWIM system provides significant cost savings over full-platform and axle scales. The vehicle loads (wheel, axle, GVW, load ratios) are automatically analysed, compared to legal limits and results are displayed on operator’s PC monitor, the driver gets the corresponding printout and the data are also recorded for further reporting or can be sent via LAN or Internet to the server.. This minimizes operator’s mistakes, offers inbuilt data protection and allows vehicle throughput up to 180 vehicles per hour. 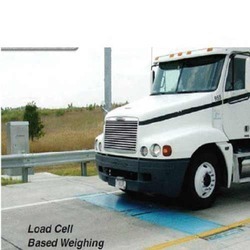 Each In Motion Truck Weigh system consist of the following components. These components will vary with the type of system you require. 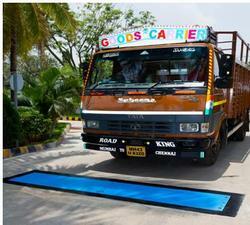 We provide Truck Weighbridge, our this Truck Weighbridge can weight a truck while it is in Slow Speed also. Our expertise lies in manufacturing, exporting and supplying a wide range of Truck Weighing System. Furthermore, with the assistance of our state-of-the-art manufacturing unit, we develop our offered range using sophisticated tools and equipment that assure its dimensional accuracy. Offered Truck Weighing System products are highly valued among clients for their high quality, durability and low maintenance. Furthermore, we are offering our offered range as per the varied specifications of clients. Our truck weighing system is available in electromechanical or full-electronic and hydraulic kinds with either steel or concrete platforms. Whereas, low profile units provide easy fabrication with nominal foundation needs while pit sort fabrications are often the prime pick for usage in critical climates or when grain is to be released from the truck onto a transporter attached under the scale platform. The multi-platform units are utilized at the same time measure the axle weight of the truck while acquiring their complete weight as well. Tuck weighing apparatus hindering maintenance, service and calibration is also obtainable. Our truck weighing system includes various specification with the distinctive choice to enhance their utility for both driver and operator. Choices comprise truck administration software, remote displays, video surveillance, power conditioning, traffic lights and so on. The range, which we are offering are considered as ideal equipment for any mobile transport weighing usages. It is light in weight, which helps ease in picking up and move. Due to its dependability, accuracy and portability, our product is used in cargo hefty equipment weighing, military deployment, commercial truck weighing, law enforcement and industrial utilization. The easy vernier weighing system dial is distinctly market for optimum visibility. Free from almost practically and indestructible maintenance. It requires no electronics or battery to perform operations in any unconventional and rough surrounding and unbalanced surfaced like gravel, cement, off-level surfaces, dirt and tar. Non-skip bottom and ramp offer exit and entry of the scale in a simple manner. Due to its light weight, it is simple to setup by using a particular designed pliable scale handles. Yields repeatable and remarkable accuracy. It is temperature compensated in any severe climatic situations as each critical portions are sealed and included in the dust-proof enclosure. We, the distinguished entity in the industry of weighing equipments, are known to be the leading manufacturer and exporter of the Truck In Motion Scale. These scales can easily weight the truck when in motion. Integrated with latest technology, these motion scales are available in different capacities to choose from. Our clients can easily get these scales from us at the industry leading prices. Manufactured from supreme quality of metals and components, the entire range of Truck In Motion Scale is in strict confirmation with the international standards. As acknowledge tear and wear of roads are determined by the vehicle weight. 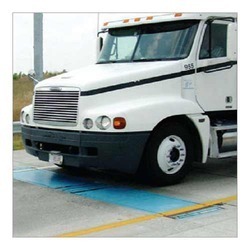 Toll authorities uses our range, which is based on weigh-in-motion advancement to judge the precise roll categorization while maintaining the traffic moving. We are providing our truck in motion scale, which has sturdy structure that prominently enhances scale reliability in heft-duty activity. It also facilitates to record accurate setting into the road in the course of installation, which also reduces the cost involved. 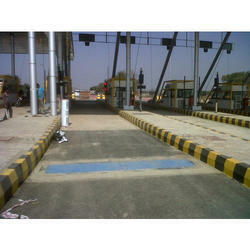 The weighbridge is linked to the signals horn and traffic lights to regulate vehicle movement. We can also deliver video camera for transport detection and transport picture capturing to the customers as per their demand. The platform is particularly designed to have all collections of axles such as tandem, single and triple, which are simply weighed as electronic can determine the weights of each axle distinctively. Close joined axles with air suspension or spring cause no trouble to the weighbridge that will yield respective axles of up to 30 Ton each. Immediate inspection for road legal load. Weighs numerous vehicles per day. Daily recorded information computes the vehicle productivity. Mechanical information of images and weight of vehicle. Axle weight, number of axles and gross weight can be recorded. Recorded information can be stored for future or can be sent through internet to the server. An ambit of computer software and indicators is obtainable for EAGLE axle, which permit authorities to select the optimum apparatus for their imposition requirements. The axle is specially suitable where accordance with legislation is essential as excessive speed weights are mechanically spotted so that transports cannot be given with wrong weighing tickets. The policy is to create only superior quality items by integrating modern advancements. Special focus is placed in the durability and reliability of the product, so that the company undertakes its own patterns and produce to keep the important level of the quality regulation. Committed to quality, we are indulged in offering Weigh In MotionSystem to the clients that is specially suited for designing, monitoring and research applications. This device is ideal for recording the axle as well as gross vehicle weights at the areas where it is installed. The provided device is manufactured with high level of precision by utilizing quality-tested basic materials and cutting-edge techniques as per international standards. Furthermore, we are offering this Weigh In Motion System to the clients in various technical specifications at negotiable costs. Weigh in motion system is an effective solution for an assortment of low and high speed weigh in motion (LS/HS-WIM) utilization as stated by global standards. 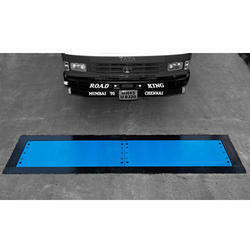 It records and maintains weights of axles, vehicles (gross) and wheels passing above weighing sensors inserted in road walkway. Every measurements are done at usual traffic paces, so an intact transport weighing can be executed unaccompanied by any traffic circulation disturbances. Our weigh in motion systems are designed for genuine multi-path dual-directional free circulation measurement and confirms the precision of each measured grounds of the transport in both road ways as well as when driving through road lanes. The precision od weighing can be minored bye non-quality vehicle behavious (deceleration, shoulder driving, acceleration, lane traversing, etc.) or various other impacts (poor road or vehicle situations, unever load distribution, etc.). Just to confirm whether the computed values are in the elucidated precise class, the apparatus offers modern measurement creditbility evalution. Our system can be amalgamated with several other ITS systems like section/spot imposistion systems, vehicle search, dimension in-motion, etc. With our two decades of rich experience, we have marked a distinct position in the industry as a leading manufacturer, exporter and supplier of quality Truck Weigh In Motion. These are manufactured under the supervision of our highly knowledgeable team using premier grade materials procured from well-known vendors of the industry. Our weigh in motions are used in capturing and recording axle weight and gross weight of the vehicles. Furthermore, our quality departments check these on various parameters of quality to ensure flawless finish. Offered Truck Weigh In Motions are available in various technical specifications and at affordable prices. Essae Truck Weigh in motion System (TWIM) is a reliable, robust, maintenance-free weighing mechanism designed to be used on highway entries with non-stop heavy traffic. Weighing accuracy and performance are approved for law enforcement purposes and trade use. Essae TWIM system provides significant cost savings over full-platform and axle scales when speed is critical and vehicle weighing is an integral part of the operation. The vehicle loads (wheel, axle, GVW, load ratios) are automatically analysed and results are displayed on operators PC monitor, the driver gets the corresponding printout and the data are also recorded for further reporting or can be sent via Internet. This results in minimum operators mistakes, offers inbuilt data protection and allows vehicle to put upto 180 vehicles per hour. It is designed to take maximum load of 40 to 50 ton per axle. An extremely important investment at check posts, octroi nakas, and transport department to detect overload of the vehicles. When any vehicle passes over the platform, the individual axle weight, the number of axles and the total weight of the vehicle are detected. 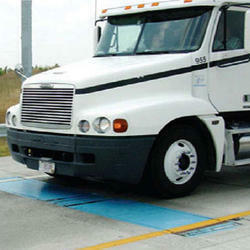 Our truck weigh in motion determines the weight of vehicle while it is moving. 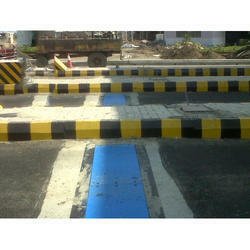 It also gathers traffic volumes through vehicle weight and categorization. The information also comprise time, speed, date, vehicle extent by axle spacing and weight of the axle. There are two kinds of WIM apparatus utilized including piezo and bending plate. TPP utilized curving plat WIM tool to gather information up to 15 locations and do survey two days during each quarter of a year. Information is gained from all running locations annually for future acknowledgment. The numerical term of WIM sited for which information is accessible ranges each year because of road conditions, road WIM hardware and construction. The platform is fabricated to have every amalgamations of axles. Tandem, tri and sinel-axle combinations are simple weighed due to the electronics, which can computed the weigh of every sole axle. Copmpact coupled axles with air or spring suspension are not troubles to the weighbridge that will have independent axles up to 30 ton each. Looking for Truck Weigh in Motion ?